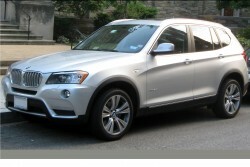 In Graz, where the BMW X3 has been manufactured until now, production will focus on Minis. Due to the accelerated expansion by over 50% of BMW's U.S. plant in Spartanburg, production in Graz will be restricted in future. 240 000 SUVs are to be produced in the U.S. In addition to the big X5 and X6, the smaller X3 -which has been manufactured until now in Styria- is to be built only in the U.S. In Graz, the 4-wheel drive Mini will be built in its place.